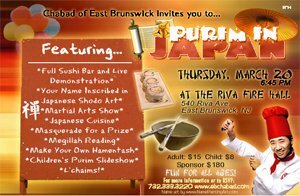 Featuring: Full sushi bar and live demonstration, Your name inscribed in Japanese Shodo art, Masquerade for a prize, Martial Arts show, Japanese cuisine dinner, Megillah reading and L'chaims! 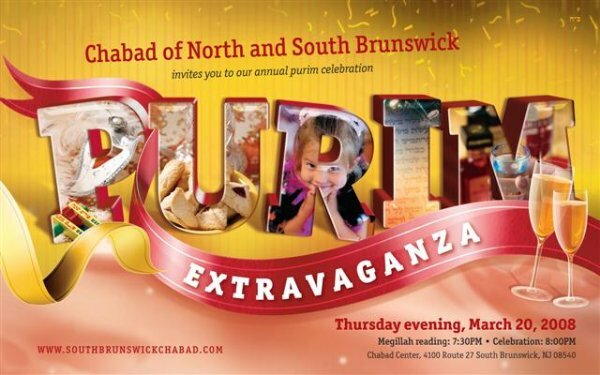 Join Chabad of North & South Brunswick in celebrating Purim on Thursday, March 20, 2008 at 7:30pm at Chabad House - 4100 Route 27, South Brunswick, NJ 08540. Following the reading of the megillah, Purim refreshments will be served with live music. Join us for an exciting Purim Brunch, featuring Megillah Reading, Graggers, Bagels-and all the Shmears, and Live Music. See Comedian Paul Lyons (Everybody Loves Raymond, and A&E's Comedy on the Road) for great family entertainment. Monroe Township High School Cafeteria, 1629 Perrineville Road, Monroe. Enjoy a Taste of Israel. Full Buffet Dinner, Schwarma, and Israeli delicacies and spirits. Dance to Israeli Music, and Hear the Whole Megillah with simultaneous Slide-show.